A good shopping trip is only as satisfying as your stomach is by the end of it. And a day at Commercial Street is no less. With kabab and roll shops aplenty, where would the vegetarians go? We scoured the area and found more than a couple for the next time you hit up the area. From dosas to chaat. In one of our previous expeditions to Commercial street we chanced upon a small dosa place that serves giant dosas. Perfect to share with your shopping buddy! When we say giant, we mean either at 2.5 feet long or 4 feet long. For those of you who don’t have an ongoing love affair with dosas, you can have tomato bhath, curd rice, pongal and some classic kesari bhath. Did you know the fast serviced snack joint of Jayanagar fame also exists on Commercial Street? Well, neither did we till we saw it. All the popular favourites like the American grilled sandwiches and classic milkshakes are served here. Ask them for the special sandwich of the day to be surprised and wash it down with one of their signature juices or milkshakes. For a slightly more solid meal, Konark dishes up South Indian, North Indian, (Indo) Chinese, Continental and chaat post 2 pm. Of course, they serve hot and cold beverages, snacks and desserts too. We recommend that you keep this as a refuelling spot either between your shopping or at the very end. As the name might suggest, they serve only the basics for very narrow time slot through the day (7 - 11 am, and 12:30 - 3:30 pm), so plan your visit accordingly; and expect a crowd. The huge plus point is that all the items are super affordable (below INR 50! ), except the meals that sell for 60 bucks a plate. So if you’re looking to save up to shop more, this is the place to eat! Tucked conveniently between shoe lane and Commercial street, the Shiv Sagar’s chaat stall will have you refuelled in a matter of minutes. While you can go in and eat at the restaurant, it is the chaat stall that offers the true prize. Known for vada paav and paav bhaji that sell like hotcakes, you may have to wait out a crowd. But the buttery paav bhaji you get at the end, is worth the wait. Another small darshini on Veerapillai street, their food sells for under INR 50 as well! Do not expect too much space to sit down and enjoy your meal. Their portions are satisfactory and will leave your belly content. With pure vegetarian, home-style food that is economical, they have our vote, especially if you’re shopping at the end of the month. The most iconic restaurant on Commercial Street needs no introduction. While they serve a variety of cuisines available, their most popular dishes always remain their South Indian and snacks! If you’re heading there during lunch or dinner time, expect a crowd and order the meals for a simple affair. Sitting down for a meal not an option? 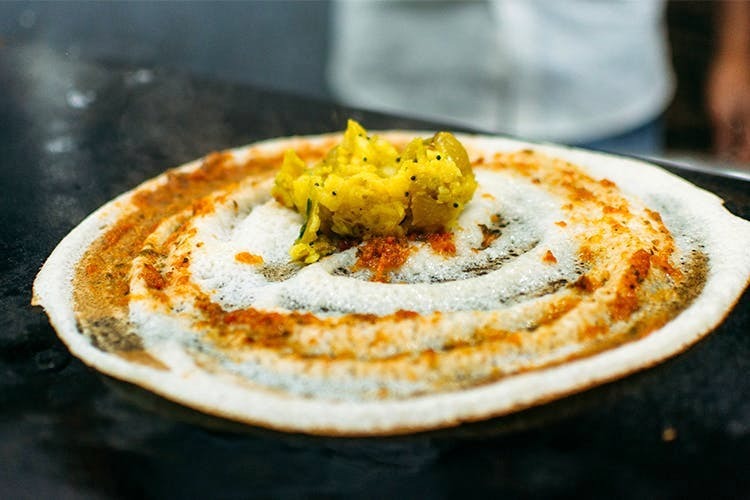 We’ve got you covered with our street food guide. Some of these are seasonally available (like certain fruits), but you’ll definitely find some munchies for snacking along Commercial Street for cheap.